The 16th April meeting and the morning of the 17th allowed us to have a closed session with OPENHYBRID partners only and to go through more technical details - turning this to be our 18th Month meeting. We can now tell that HMT head developed in OPENHYBRID will be launched to the market within two months - fantastic work. 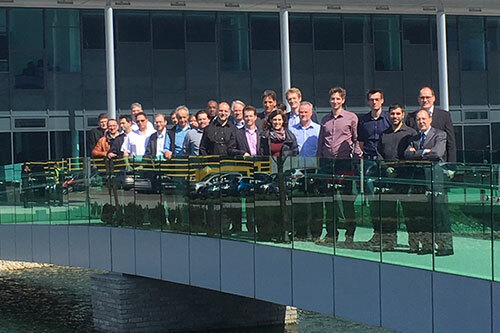 On the afternoon of the 17th, the consortium had the opportunity to present to the Project and Monitoring Officers from European Commission, the progress made within WP1 to 5 (industry requirements, process tools, material and process parameter development, process monitoring and modelling). Also, we had the chance to assist to several demonstrations on the MTC's lab, such a smart cladding head and laser scanning. Day two of the review meeting was dedicated to present the interface development and platform integration and how all of this will be validated regarding implementation into the end-users own production. The Initial Business Plan was presented along with the dissemination strategies. In the end, the OPENHYBRID consortium is glad to inform you that the project has received good feedback.